Please observe IMMEDIATE RESULTS, upon completion of our initialPRP and Microneedling Treatment for lower lid laxity. Tissues surrounding the eyes are 90% more delicate than any area in the body. These tissues can be Rejuvenated, to Thicker, More Hydrated, Youthful, and Vibrant Appearance. 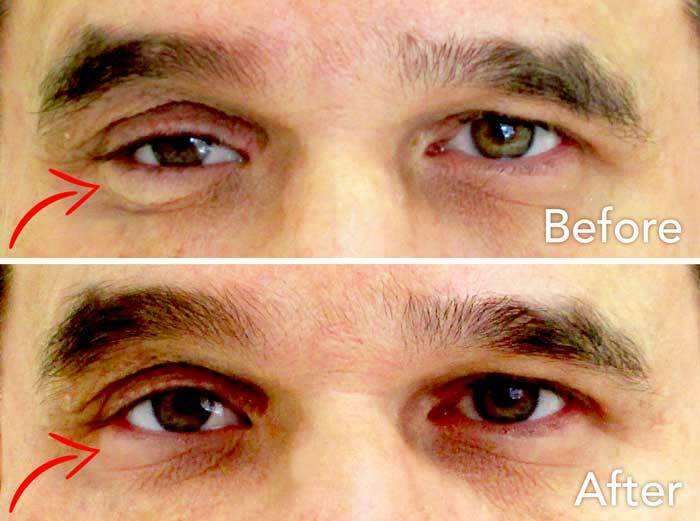 PRP and Microneedling effectively Rejuvenates Under Eye Hollows, Dark Circles, Crows Feet, Fine Lines and Wrinkles. PRP – Platelet Rich Plasma Growth Factors – Known as “Liquid Gold” – Platelet’s From YOUR OWN BLOOD, a NATURAL way to produce new collagen for around your eyes and skin, as well as stimulation of your hair follicles to promotes new hair growth and thicker hair where it may be thinning. Microneedling and PRP – Also known as Collagen Induction Therapy, is a minimally invasive skin rejuvenation procedure that involves the use of a device that contains fine needles. Using PRP will further aid in new collagen production, to rejuvenate and rebuild healthier, more youthful Skin and Eyes! Sculptra – Injectable Poly-L-lactic Acid (PLLA) – for people with healthy immune systems for the correction of shallow to deep nasolabial fold contour deficiencies, other facial wrinkles and fine lines. Furthermore, as we age, the fat, muscles, bone, and skin in our face begins to thin. This loss of volume leads to either a sunken or sagging appearance of the face. PLLA is used to create structure, framework, and volume to the face. Treatment that works deep within the skin to help stimulate collagen production. Unlike, hyaluronic acid fillers, Sculptra helps stimulate the skin’s own natural collagen production. Over time your skin breaks down PLLA into water and carbon dioxide. The effects of PLLA appear gradually over a few months, producing natural results. Sculptra and PRP – When Sculptra, a collagen stimulator, is paired with PRP – The PRP can help surface-level lines and wrinkles fade more quickly while the Sculptra works to build collagen in the skin’s deeper layers. We offer several products from Purigenex. Most popularly known for their “Post Microneedling and PRP Treatment” – Their Ionized Collagen Mask, The only Type 1 collagen available in topical cosmetic form. Unique anti-aging treatment using cutting edge collagen to help prevent and repair aging, sun damage, discolorations, and acne scarring. Supports and builds connective tissue integrity and elasticity-skin will appear smoother, plumper, more supple, and more youthful. Highly soluble succinylated and negatively ionized collagen provides superior transdermal penetration and integration with human skin cells. Exclusive telopeptide-free formula ensures rare to no immune reaction.